December 23, 2013 December 23, 2013 by Beau H.
If you’re anything like me, the last few days before Christmas are a bit of a scramble to finish wrapping gifts and getting everything set for two special days — Christmas Eve and Christmas. Ideally, since this time is most often spent with family, it’s good to not have to think too much about what to wear on those days. And it’s wise to not overdo it too much, either — but you should still dress to impress (although Christmas is one of those days where it’s OK to wear your pajamas all day). Let’s take it from the top with an outfit that could work on both Christmas Eve and Christmas. 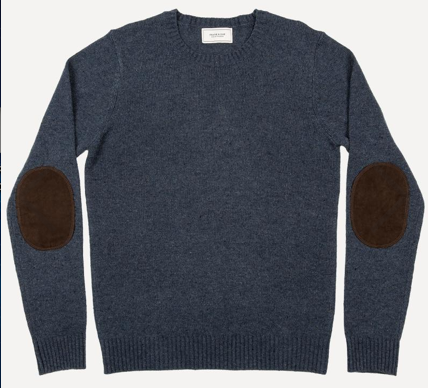 Different texture, and with elbow patches for variety. In most parts of the country this time of year, it’s pretty cold (including New Hampshire, where the Siblings With Style operation has gone mobile this week). That’s why a sweater will work more than sufficiently to stave off the chill. But, use some more variety here than with a standard v-neck sweater. That’s why a donegal wool crew (the above option pictured is from Frank & Oak) does the job nicely. The wool’s texture is subtly different from a classic merino or wool sweater (note the flecks in the fabric), and the crew neck means this can be worn more casually atop a plain t-shirt. The elbow patches break up the outfit by adding another subtle textural difference, and that touch is certainly a modern take on an older classic. The same holds true for the fair isle crewneck alternative. The pattern is perfect for the holidays — it’s certainly ‘of-the-moment’, but it incorporates a cold-weather feel, too. And in slim new iterations from places like J. Crew and even Old Navy, the fair isle sweater fits the mold of a nice modern update. Additionally, because that fair isle pattern is louder, it can easily be dialed down by pairing it with the perfect pair of dark denim. Workwear details and rough cold-weather texture. Assuming you stick with a nice wool crew, it’s wise to keep your shirt in the same casual area. That could mean as something as simple as a charcoal or grey t-shirt, but if you’re stepping out of the house to visit family or heading to a casual party, a collared shirt is probably the more polished way to go. It’s easy here to turn to a simple white or blue Oxford cloth button-down, but the slightly unique texture of the sweater calls for a slightly more unique shirt. 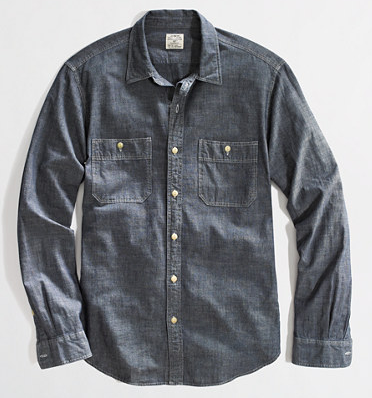 Chambray is the ideal in-between medium —a step up from an OCBD in terms of visual interest, and able to be worn in fall and winter with equal ease — the rough, workwear-inspired roots of chambray are the answer to colder temps in the later parts of the year, including around Christmas. Hawkings McGill chinos from Urban Outfitters. Even though Christmas is a decidedly casual holiday when it’s spent at home, the day before and the day itself present a variety of potential style situations. If both days are spent at home, a lighter-washed, more casual denim, kept slim and with some distressing (yes, some) could be your ticket to casual style. 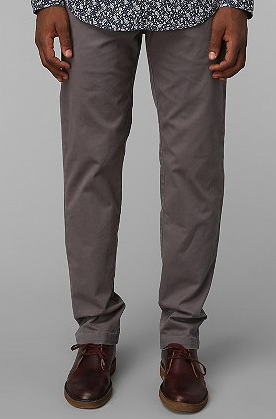 But in both instances, slim chinos in a neutral color (as seen above) work perfectly. Something in a darker fall or winter shade (like burnt orange or burgundy) could definitely work as well. In this instance, chinos allow you to be a bit more polished at home or just as ready to jump up and head out to a movie or dinner, a place where jeans might not go a long way. A high-quality boot with years of history behind it. As with much of the day, this is one holiday where not a lot might be required of you in terms of errands, chores or, well, much of anything involving leaving the house. But, if the day involves trekking through some snow, a sturdy pair of boots is the way to go when the weather turns frosty. When you add a different component (like a slightly different color) outside of a standard wingtip or ‘work’ boot, the right pair of shoes can work across multiple seasons and situations. That’s where the Red Wing Beckman boots come in. The cherry shade of this particular pair is beautifully rich in color and extremely high-quality, if reviews and anecdotal history are any indication (46 out of 51 reviews on Amazon were 4 or 5 star ratings). That red cherry color means that the boot could feasibly be worn with either a black or brown leather belt — don’t worry about matching leathers, here. And the boot’s deep color falls in line with the elbow patches of the sweater and the rough texture of the chambray shirt — all subtly different touches from typical items. Thick and warm socks to stand up to the heat. Is $16.50 a lot for a pair of socks, like the J. Crew option as shown in the link? Definitely. 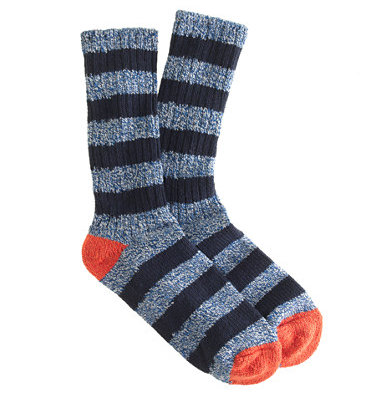 But, if it’s particularly chilly where you live, a nice, thick pair of socks could see a lot of duty in the fall and winter, so it’s a slight investment in the grand scheme of things. That particular pair has some notes of blue and black that would play off other colors in the outfit, like the sweater, shirt and chinos. That’s a little touch that can go a long way in complementing an outfit, something any good pair of socks should accomplish. 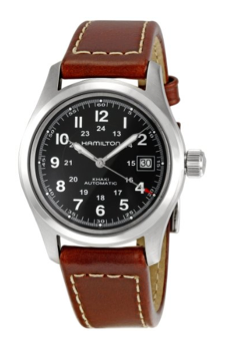 Because the outfit is casual overall, leave the stainless steel dive watch in the box this time, and reach for a cheap (yet still polished-looking) watch like a Timex. It’s a leather strap but still maintains a field-ready look, and again, don’t worry about matching leathers with the shoes here. There you have it. Enjoy the Christmas season with family and friends, and do your best to look your best in the process. Merry Christmas, happy holidays and thanks for reading! December 18, 2013 December 18, 2013 by Beau H.
Thanks to thoughts from Siblings With Style’s female perspective, the Christmas spirit is alive and well in the Great White North…er, Michigan’s Siblings With Style hub. Personally, holiday season shopping is a pretty easy time to pinpoint what’s affordable and attainable for gift-asking — and what’s simply not. But without further ado, (and if Santa’s willing to splurge a little … or a lot), here’s what’s on my ultimate wish list this year. By Billy Reid. 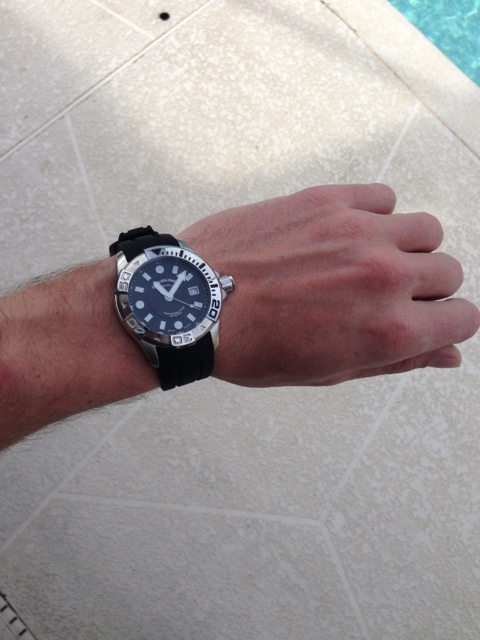 As worn by 007 himself. A beautiful burgundy leather in a classic silhouette. 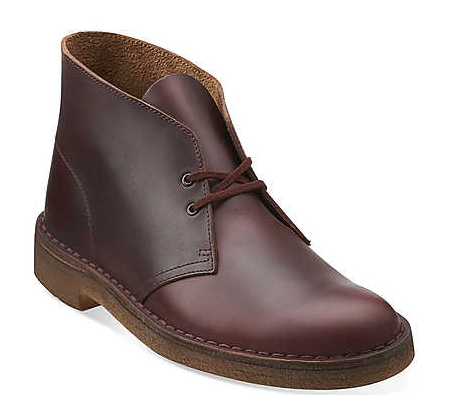 It’s clear that a good desert boot is a true style essential, but this pair takes the tried-and-true Clarks silhouette and bumps it up a notch, using rich Chromexcel leather in a great burgundy shade (among others). By taking a classic outline and ramping it up with unique and beautiful materials, they’ve created a hot collaboration with style to burn. This piece isn’t nearly as pricey as the Bond peacoat, for example, but from the looks of things, it’s still worth every penny. And more than worthy of my list, to boot … (pun intended). Shopping on a budget for versatile and classic-looking pieces can make it difficult to splurge on the big-ticket items, items that will last decades or even longer. The Allen Edmonds Strand Cap-Toe Oxfords are a shoe more than worthy of that title, and more than worthy of envy. The American-based shoemaker’s items always seem to generate exceedingly positive reviews and have remarkable durability. 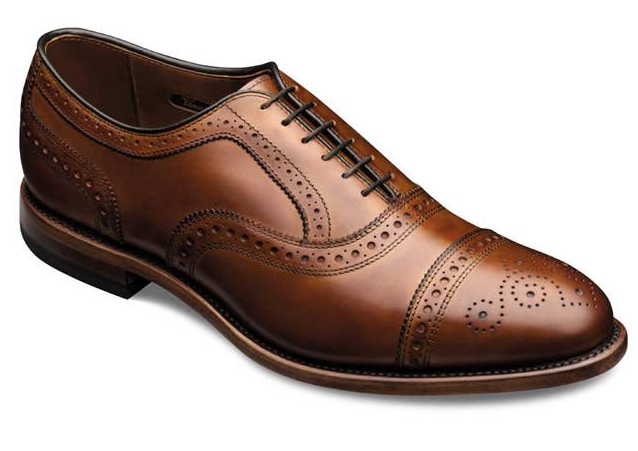 In the case of this pair of shoes, they’d stand out with nearly any suit, from charcoal to navy or light grey. For one pair of shoes, they’re more than worth the sticker price. Black and brown? In a watch? Yes and yes. So that’s my personal Christmas wish list. Any thoughts or feedback? What’s on your list? Leave it in the comments below! December 18, 2013 by Beau H.
Christmas is only a couple days away — is it too late to write to Santa and ask for these fashionable items? 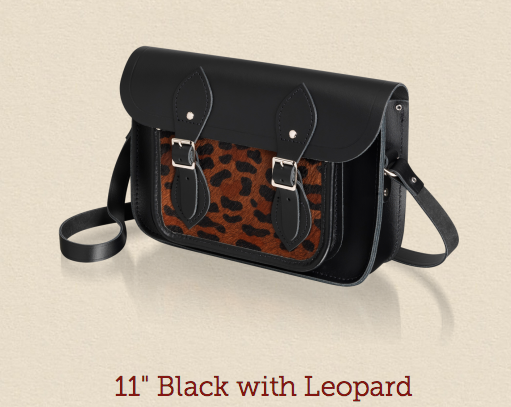 The Cambridge Satchel Co just released this bag earlier today. It’s perfect for winter and has a great edge. Sure it’s a little pricey, but the quality is great and a girl can dream, right? This dress is perfect for this holiday season! Or perhaps to wear to the Rose Parade? The vintage silhouette of this dress is sure to catch eyes at any holiday party! 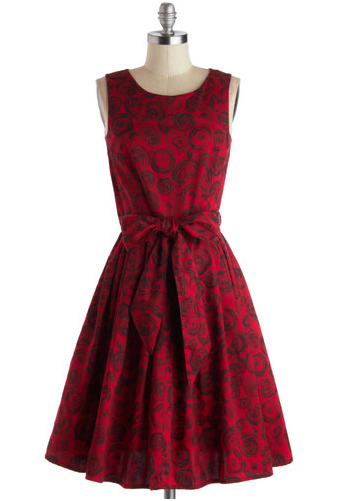 Modcloth has so many festive dresses that I will be dreaming of this Christmas. The Urban Outfitters X Jeffrey Campbell collaboration has so many shoes that are to die for! These heels are wintery enough in style, but still reasonable to wear in Florida. 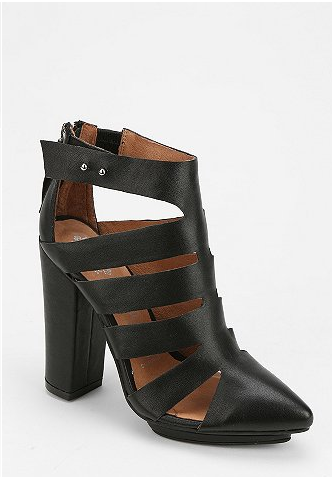 I would pair these with a pleather skirt and cardigan for a casual but seasonal look. My holiday season wishlist would be completed with a few pairs of tights, several pairs of Christmas socks (to be worn poking out of my combat boots), a beret, and a Christmas mug. These items are more reasonably attainable than my swoon-worthy fashionable items, but maybe Santa is feeling stylish this year! 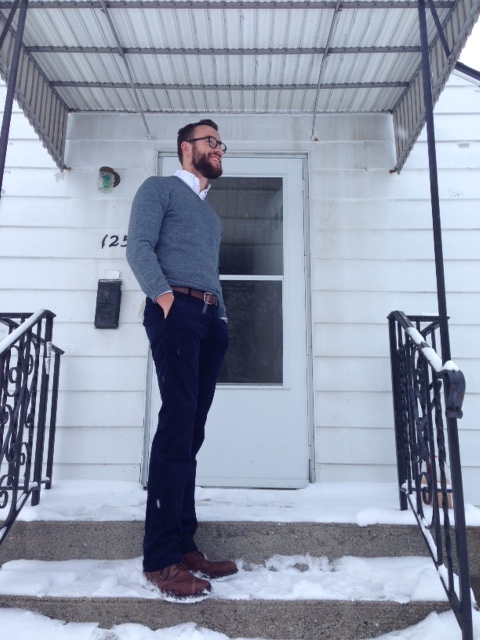 December 16, 2013 December 16, 2013 by Beau H.
One of the first keys to establishing great style is finding pieces that you love to wear over and over again. For many, dark denim fills this void more than adequately in terms of pants. However, it’s always ideal to mix up textures and fabrics with things like chinos in seasonally appropriate shades. Corduroys are another great way to find a denim alternative, as well. A relatively new start-up out of New York City’s Garment District, Jomers is looking to meet that need for fashionable guys everywhere. Joe over at Dappered first reviewed their cords back in August, and some readers noted similarities to Bonobos, but believe me, these are different in price and looks. It took me a while to get my hands on a sample pair of them, but now the review is in. Read on below, and to check out an interview with the company’s founder, click here. Jomers Curacao corduroys. Waist size, 33. Shirt by Target Merona. Sweater by Old Navy. The first (and perhaps most noticeable) part about these corduroys is the texture. They’re a pinwale cord, which is very fine and light. As a whole, the fabric is very airy and breathable, which would make these perfect for summer and spring, but probably not as much for the fall and winter — although that’s not to say they couldn’t be worn in those seasons. The fit is quite trim, very close to a Levi’s 513. Or, if you happen to wear Frank and Oak’s Newport Chinos, the fit is quite close to that as well — slim with some taper, but not as tight as a Levi’s 510 or 511. It’s something definitely preferable for those who are trim, but even the beefier guys among us could probably use a slimmer pair of pants, too. The fabric also has a decent stretch to it, which contributes to the breathability factor. In terms of length, the cord is long enough to be cuffed, but also sits with minimal break over a pair of shoes (or in the case of the photo, wingtip boots). The color of the pants is also quite nice — a dark, rich navy that’s just different enough from jeans or chinos thanks to the thin pinwale cord. From the looks of the site, they offer a variety of other colors, mostly in vibrant shades. Patterned detailing along the waistband. A similar pattern in the back pockets. 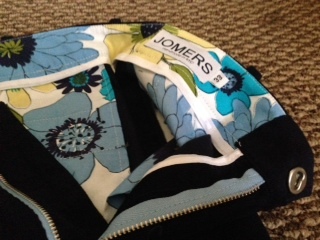 Additionally, the detailing on these Jomers cords are what sets them apart, as you can see above. The floral pattern is actually a pretty interesting touch, although some might be wary to take these for a spin in a conservative office because of that slight detail. It’s just different enough to set these apart from another pair of pants, however. The fly is a slide-lock closure, another sturdy touch that makes these worth the price. And on that note, the price isn’t bad at all for the Curacao at $50. From the looks of things, the most expensive it gets for a pair of Jomers is $56 or so — and shipping is free for all domestic orders. For a starter pair of corduroys that would change up your denim and chinos rotation, that’s practically a steal. Furthermore, despite some of the inherent similarities to Bonobos, you won’t find a pair of Bonobos pants at that price point hardly ever. If you’re shopping on a budget, Jomers are the way to go. Quality and looks at the right price. Can’t ask for much more than that when it comes to style. December 11, 2013 December 11, 2013 by Beau H.
With the explosion of the Internet and the #menswear trend, it’s never been easier to find great looks (or more looks) online. In my limited blogging, experience, I’ve found sites like Pinterest to be great assets for inspiration, layering, colors and looks (personal Pinterest site here). But, I hadn’t yet got involved in the Tumblr “game”, so to speak. That’s where this post comes in. To get more value-added content, photos and general thoughts and ideas on men’s fashion and style outside of these blog posts, visit my Tumblr page here! I hope to use the site as a means of furthering visual inspiration, posting cool finds and advancing key style fundamentals. Check it out and stay sharp. December 9, 2013 December 9, 2013 by Beau H.
This just in to the Siblings With Style Michigan hub: It’s cold outside. Bone-chillingly, windswept cold. If you’re fortunate enough to live in a warmer, more temperate climate, that’s fantastic — don’t let key style essentials go to waste just because the month on the calendar’s changed to “winter time.” On the other hand,for those of us in colder weather, there are some critical essentials to keep in mind when it gets exceedingly cold. In these instances, style doesn’t have to be sacrificed for utility. Many times, it’s about using pieces you might already have in combinations that maximize staying warm (like while walking across campus) with looking sharp. Accessories that hit the right price point while also keeping looks in mind are going to carry you through the colder months, without a doubt. Pull together all of these cold-weather essentials with the tips below. Assuming you’ve already stocked up on layering pieces like v-neck sweaters or Oxford cloth button-downs, the top part of your outfit is the best defense when winter bites back. There’s debate on the formality of wearing a longer topcoat with more casual wear, however, in some cases, it definitely works. Yet, while a topcoat is going to look razor-sharp with suits and more tailored gear, a peacoat provides more versatility in that it, ideally, is long enough to cover a suit jacket but also suitable to throw on as part of a simpler uniform. 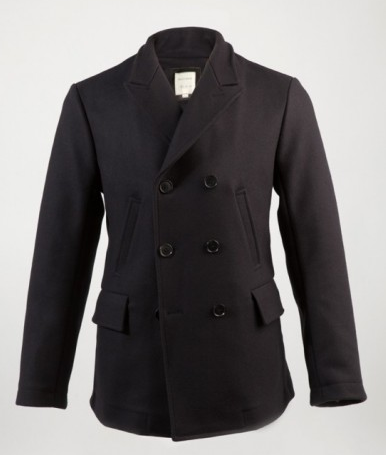 In fact, a navy peacoat is about as classic an outerwear piece as it gets. It goes with black or brown shoes, jeans or chinos, and everything in between. When found on the cheap at a surplus store, it offers a ton of bang for your buck — affordable, comfortable, warm and able to be worn with everything from a cardigan and jeans to a blazer. 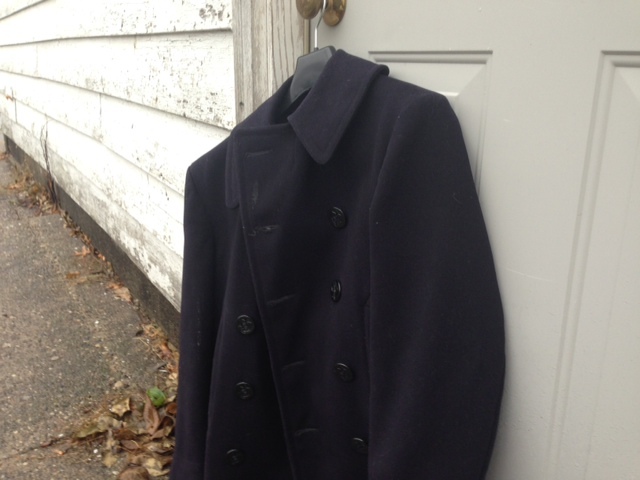 In places where it’s extremely cold (and even in milder locations), a peacoat still leaves some areas exposed. Namely, your neck. Don’t underestimate the power of a thick scarf in keeping out winter’s chill. The right scarves are (from a personal standpoint), versatile and neutral enough in terms of color to complement other looks. If you don’t have the cash lying around to afford multiple scarves with patterns, something with a more solid knit is a decidedly better option. Of course, cheaper patterned options definitely exist,but something in neutral shades (like this H&M option) goes will underneath a dark jacket. Trekking large distances in the snow presents an extremely difficult style conundrum, a true function-over-form battle. Assuming you want to maintain decorum in an office or a classroom while making even a short jaunt from your car more bearable, desert boots work appropriately in some business casual situations — particularly in waxed leather, which can take more of a beating than suede options. If the softer crepe sole of many desert boots is concerning, you could stick with a sturdy pair of Wolverine boots similar to the ones pictured above, although that price point is quite high for many, and those wouldn’t pair as easily with, say, dressier wool trousers. For battling the elements on cross-campus walks, the Wolverine boots are a great option. There’s no silver bullet for dressiness and functionality, but the Allen Edmonds Dalton wingtip boot is the envy of many —a boot with killer looks to spare, appropriate for just about any office and easily wearable with a suit or jeans. On that note, however, places like JC Penney offer a more casual boot with a functional rubber sole without sacrificing looks. 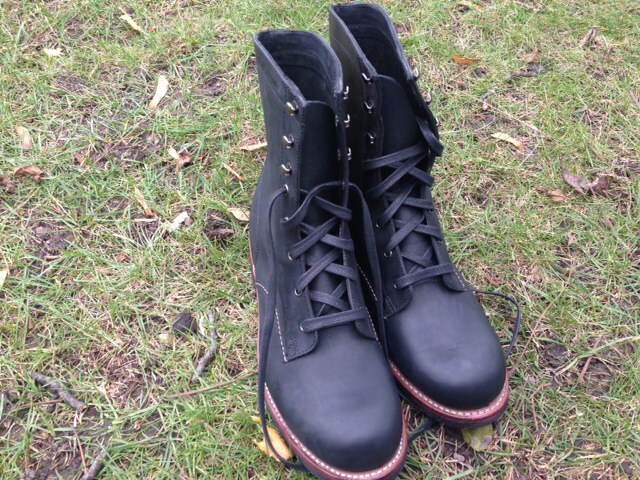 Like much else, tailor your boots to the weather in the air (and on the ground). Dressing up? 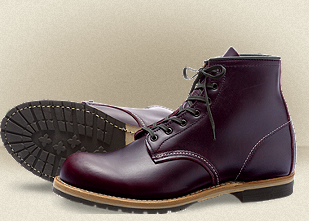 Go for a wingtip boot. Braving a few inches of snow? Those Wolverine 1000K’s are your best bet. Here, having multiple pairs might actually come in handy. The chunky ski gloves you have for hitting the slopes work perfectly well in rugged outdoor conditions, but throwing on that same pair to hit the town or even walk to class or the office just doesn’t vibe as well. As with the scarf, sticking with a simple, practical combination (without patterns or wild colors) can help you save money. And, a sleeker pair of leather gloves looks good on most guys, quite honestly. Ask James Bond. Now, there are numerous options as far as glove types go, and many fit certain situations perfectly. For maximum versatility though, a leather pair will likely dress up the outfit to an appropriate degree when worn in combination with a suit, and complement even a more casual sweater-and-jeans pairing suitably. In all honesty, splurging more on a pair of gloves is a great option for the long-haul — paying the price up front could keep your hands warm for years, although it might hurt a bit at the time. In the truly, truly cold climes, sometimes a knit cap is the only way to stave off high winds and snow. There are definitely ways to wear one without looking ragged, have no fear. In fact, the same spot where you picked up a scarf or gloves might have a nice, incredibly affordable option. With something like a suit, it’s probably best to brave a bit of snow and wind if you want to maintain a crisp overall look. But when the situation calls for it, a knit cap can compliment, not detract from, your outfit when in a neutral shade like charcoal or black. With these essentials in mind, getting dressed and then staying warm should be as easy as reaching into your closet. Stoke the fire and bundle up.